In September 1965, The Hollywood Reporter ran the following advertisement: "Madness folk & roll musicians, singers wanted for acting roles in new TV show. Parts for 4 insane boys." The Monkees were born. These were the days when the seeds of Pop Idol and X Factor had yet to germinate in the mind of a five-year-old Simon Fuller. Englishman Davy Jones was a former jockey who had achieved some initial success on the musical stage (in 1964, Jones appeared with the cast of Oliver! on The Ed Sullivan Show the night of the Beatles' live American debut). The Monkees story began in 1965, when Bob Rafelson and Bert Schneider, a pair of producers, came up with an idea for a television series about a rock group. Inspired by Richard Lester's groundbreaking comedies with the Beatles, A Hard Day's Night and Help!, Rafelson and Schneider imagined a situation comedy in which a four-piece band had wacky adventures every week and occasionally burst into song. The NBC television network liked the idea, and production began on The Monkees in early 1966. Don Kirshner, a music business veteran, was appointed music coordinator for the series, and Tommy Boyce and Bobby Hart, a producing and songwriting team, signed on to handle much of the day-to-day chores of creating music for the show's fictive band. Avant-garde film techniques—such as improvisation, quick cuts, jump cuts—helped win the show two Emmy awards in 1967 and propelled its four stars to pop stardom. John Lennon called them "the Marx Brothers of rock", but in 1967, The Monkees outsold both the Beatles and the Rolling Stones combined, and went on to sell 50 million records. The show also saw heavy cross-promotion and product placement, with prominent promotion of sponsors such as Gretsch (for musical instruments), Kellogg's breakfast cereals, and Yardley's shaving supplies. The series was sponsored on alternate weeks by Kellogg's Cereals and Yardley of London. The Monkees resided in a two-story beach house at 1334 North Beechwood Blvd. in Malibu, California. The front of the first floor was a combination of the living room, dining room and kitchen. In the back, overlooking the Pacific Ocean, was an alcove where the Monkees kept their instruments and rehearsed songs. The walls were covered with various signs and posters, such as the "MONEY IS THE ROOT OF ALL EVIL" sign near the kitchen and the "IN CASE OF FIRE, RUN" sign with an arrow pointing to an old-fashioned fire extinguisher near the front door. 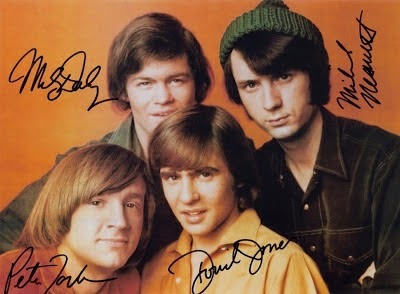 The Monkees premiered on NBC in September 1966; this was just the start of The Monkees phenomenon. "Last Train to Clarksville," the group's first single, had become a number one hit a few weeks earlier. The Monkees were the first group to exploit television and have songs written for them by classic Brill Building artists (Neil Diamond, Gerry Goffin and Carole King, Barry Mann and Cynthia Weil, Harry Nilsson, Tommy Boyce and Bobby Hart, and Jeff Barry). And what great tunes they were: "Last Train to Clarksville", "Daydream Believer", "A Little Bit Me, a Little Bit You", "I'm a Believer" and "Pleasant Valley Sunday".